Overall, we’ve had a relatively quiet week. SCG’s Modern Open was won by Ross Merriam, a like-minded fellow, with a full grip of Arclight Phoenixes. This is roughly the amount of success needed to at least include a card in the “won’t get you laughed out of the room for discussing” tier, and is the first step towards becoming “staple of at least tier two.” We saw a similar pathway for Humans and Spirits over the last year or so. Other than that, GP Shizuoka wasn’t terribly thrilling. Legacy had little in the way of upsets, as is expected. Their Standard showing was heavy on the Golgari, with no meaningful innovation as far as we’re concerned, with one exception to that rule. The Ultimate Masters fervor has died down. Expect this trend to be repeated over the next few weeks, with much of everyone’s attention preoccupied with holiday parties, gift shopping, and getting colds. Early in Guilds of Ravnica’s lifespan March of the Multitudes was a bit of a breakout card. Checking the price graph, you can see it from $10 to $5, then skyrocket to $20. Since then it’s dwindled, as shortly after GRN’s release it became apparent that Selesnya wasn’t one of the guilds to beat this time around. Turns out Voice of Resurgence did GW a big favor the last time we were in Ravnica. GP Shizuoka wasn’t terribly exciting, although there was an appearance in the top 8 of a GW tokens build with a full grip of Marches. Given that Golgari Midrange is mostly a goodstuff deck as BG has been so many times before it, it is vulnerable to wide strategies just as its forefathers before. Ravenous Chupacabra is a lot less impressive one when of your cards creates four separate bodies. March has fallen to about $6, which is a far cry from the $20 it hit during spoilers. While token strategies haven’t found their place in Standard yet, this success in Japan may herald a shift in the metagame, especially as Golgari is liable to continue to do well at non-Pro Tour tournaments worldwide. 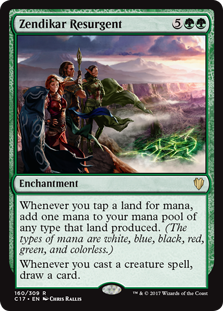 If GW token strategies, and March of the Multitudes along with them, become a prominent part of Standard, expect this archetype-defining 4x mythic to get a bit more expensive than six bucks. 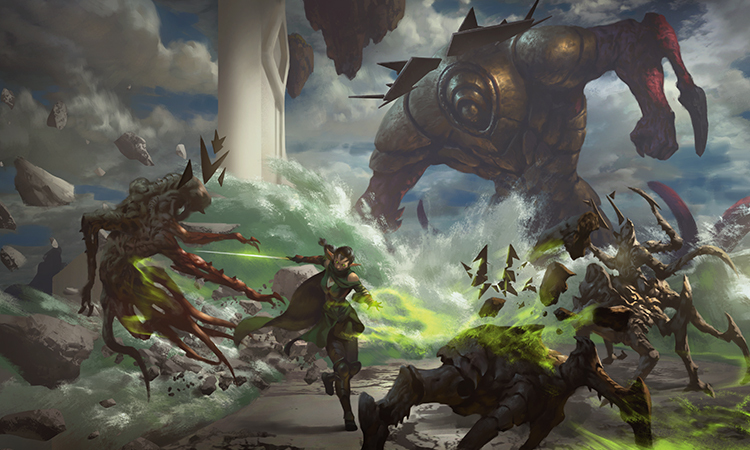 Take a peek at the staple list of Modern and you’ll find that the 4th most played spell — ahead of Thoughtseize, Serum Visions, and Ancient Stirrings — is Rest in Peace. There’s no doubt Dredge is having a bit of a moment in Modern, which will eventually fade, as the format is cyclical, but even if Hollow One is banned, Rest in Peace will remain relevant. I heavily played Modern from the outset for years and years, and my RIPs rarely left a deck’s sleeves and ended up back in my collection binder. No matter what’s going on in the format, somebody is trying to abuse their graveyard, because the single second people stop running graveyard hate, some chucklehead with Worldfire, Flame Jab, and Spellweaver Helix is going to show up and crush an SCG Open. You’ll find foils from Return to Ravnica at the $20 price point today, though supply is shallow for sure. There’s a playset around $20 to $21, another three around $25, and then that’s it. Masters 25 copies, the ones we’re looking at, start at $15 instead. There’s a whopping 11 NM copies on TCG at the time of publication. I’d expect the M25 copies to catch up to the $20 to $22 price point reasonably soon, and both copies will start pushing closer to $25 or $30 without an intervention on Wizards’ part. Independent of Modern and Standard, EDH keeps on chugging. Looking into Jodah, Archmage Eternal, Zendikar Resurgent jumped out at me. When Resurgent was printed it was one of those “oh this will be an awesome pickup for EDH in two or three years.” Here we are a little under three years later, and I’m starting to like it more and more. Unsurprisingly, it’s wildly popular in the format. There are over 15,000 listings on EDHREC, ranking it as a true format staple. At the same time, foil supplies are getting shallow. We’re not talking RIP shallow, but still shallow. You’ll find a handful of singles in the $6 range, a few more under $10, and then the ladder to $15 and $20 is short and quick. Zendikar Resurgent is highly popular, has one printing, and is most likely to see future reprints come in Commander product, which will be lacking in foils. Attrition should pull this up from $6 towards at least $10, and probably $12 to $15, or even $20 if we go another two years. I usually Google [magic set] art and pick something with roughly appropriate dimensions. I don’t want to pick art from one of the cards lest I give away too much information right away! Good short list Travis. I like all of these picks. Quite a bit.